Tomorrow, November 12th is Veteran's Day and there are a few happenings here in Beaufort SC in honor of this special holiday. Beaufort has a strong military presence from Parris Island to MCAS, that many not only do their training here, but end up retiring in our beautiful community. Take some time out of your day tomorrow, and celebrate with our veterans. Starting at 9:30am there will be the annual Beaufort Veterans Day Parade. It lasts about an hour, and consists of parade marchers, bands, and floats. 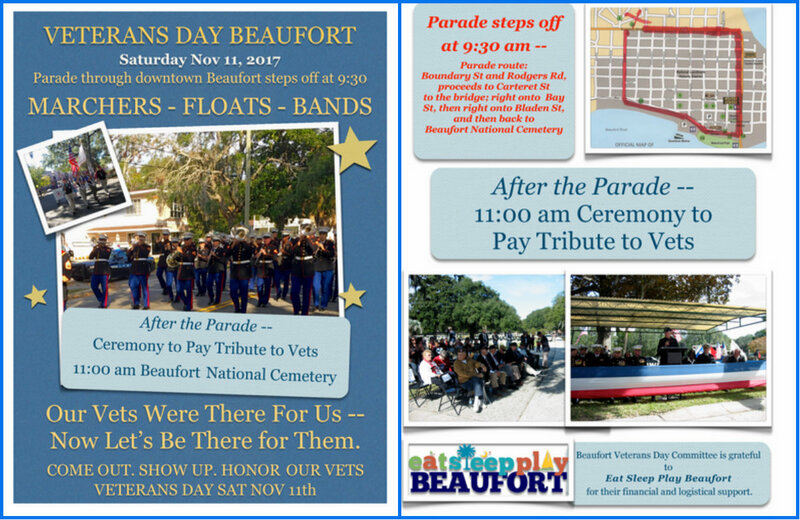 Bring a beach chair and show your support to our veterans by enjoying the parade sponsored by Eat, Sleep, Play, Beaufort. The parade starts downtown and will go down Bay Street. Following the parade, there will be a ceremony that starts at 11:00am at the Beaufort National Cemetery. The famous Parris Island Marine Band will be performing, and the speaker of the ceremony will be Purple Heart recipient Glenn Blackburn. Glenn is a 27 year veteran of the 101st Airborne Division of the US Army. If you are a veteran or currently serving our country, there are several local restaurants that will be offering free food. Buffalo Wild Wings, Dunkin' Donuts, Golden Corral, Wayback Burgers, and IHOP are only a few that will be offering free food. Make sure to stop at one, or a few of these for some free food! Enjoy the festivities that will be taking place in Beaufort SC tomorrow. Come out and support our veterans, as well as those who are currently in the military.